My kids rave about this dish and often ask for the recipe, so here it is. The thing is, I always made it because it was cheap and tuna’s good for you. 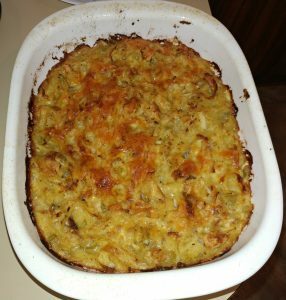 The photo above is actually Salmon casserole because while my other half doesn’t like tuna or noodles, he LOVES my salmon casserole. It’s made with the same ingredients, just substitute the tuna with salmon. My kids rave about this dish and often ask for the recipe, so here it is. The thing is, I always made it because it was cheap and tuna's good for you. First cook the noodles as directed on the package, but cook for a couple minutes less (as noodles will continue cooking and absorb the flavours from the casserole). In a largish bowl, mix tuna and margarine, then add about a tsp each of the seasonings along with the Parmesan cheese and mix well, Now grab a clean spoon and taste, adding seasoning and cheese as needed (and using a clean spoon each time you taste). When you find you want to just sit and eat it without putting it in the oven, you know it’s ready! HONEST, this is how I know it’s ready! Now mix in the noodles and once they’re mixed in, add some milk – just enough to make it wet. If you like really wet sloppy creamy tuna noodles, make sure to add enough milk so it’s quite wet. If you like yours dryer, use less milk. I have found a can of evaporated milk gives just enough whether I use two cans of tuna and 1 whole bag of noodles or if I use half a bag and 1 can of tuna. If you like, you can crumble up a bunch of potato chips to put on the top, but I usually skipped that (my Mom did the chip thing) and instead put a layer of Parmesan cheese and more seasonings on top. Cook for about 45mins at 350f (that’s about 180c) and check on it. The main thing is to make sure when you stick a big spoon in the center that it’s not all milk. If you like it dryer, cook it a bit longer. The tuna, noodles and Parmesan cheese and milk are required, everything else is optional and to suit your taste. DON’T add salt as the parmesan cheese is already quite salty. The Tuna can be either the kind packed in oil or water is fine. Make sure and drain it though. If you want to make less, use half a bag of noodles and half the tuna. I purposely typed in instructions for a large batch so that you can either make it and freeze some or have enough to feed your army.